Black-Grape Lassi is yet another cool & refreshing drink to beat the heat in summers. This time I tried new version of Lassi with black grapes. It is very delicious and healthy drink with lots of fiber. There are many ways to make this recipe and this is one of them, it's easy and delicious lassi. This lassi blend with black grapes, sugar and other delicious ingredients. 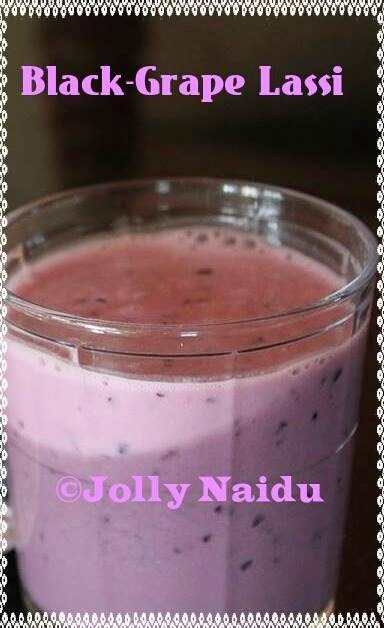 Learn here, how to make black-grapes lassi at home with very easy steps..
1. For preparing black grapes lassi, blend sugar, milk, black grapes, yogurt and cream. 2. Pour into the glasses and garnish with sliced black grapes and top with crushed ice-cubes. 3. Black grapes lassi is ready. Serve immediately.